Carich Blogs | Who Am I to Judge? Packet pick up/pre-race went pretty smoothly. A nice local lady recommended the Blue Cat Brew Pub in Rock Island for dinner. The food was great, but the service was terrible. I was the only one brave enough to try the beer and it was just okay. I’d definitely go back and try some of their other selections some time. The Quad Cities are a LOT nicer than I expected. I guess I didn’t know what to expect, but they had really cute shops, a quaint downtown area, etc. Definitely worth a visit. Race day weather was *perfect*– it was a little chilly at the start and I got goose bumps when I was waiting at the relay exchange zone, but it was perfect for running. Sunny and about 67 or so. The course was breathtakingly beautiful– It was a 5 person relay and 4 of us had scenic routes. There were 3 bridges and 4 towns. One of my teammates got to run on the Interstate bridge from IL to Iowa. Most of the routes ran along the river and it was just a picture-perfect fall day. I’d never run a relay before, so I was a little apprehensive about getting from one leg to another and making sure we didn’t “miss” one another. Luckily, they had a well-organized shuttle system to transport runners from the start/finish line to their legs. My exchange zone happened to be 1 block away from our hotel. I could’ve walked there, but I wasn’t familiar enough with the area, so I rode the bus from the start/finish line and waited for about an hour. My leg was the middle leg, so I wasn’t able to watch any of the other exchanges, but we didn’t get lost and no one had to run an extra leg because the next runner wasn’t there. Definite plus in my book. The exchange zones themselves were well-run. There was a volunteer with a bullhorn yelling out bib numbers so you didn’t have to worry about missing the exchange. Each relay exchange was well-stocked with water and snacks, too. Speaking of snacks—this race went above and beyond in the amenities department. In addition to the usual water/Gatorade/Gu, they had oranges, bananas, cold sponges and even Vaseline on the course. 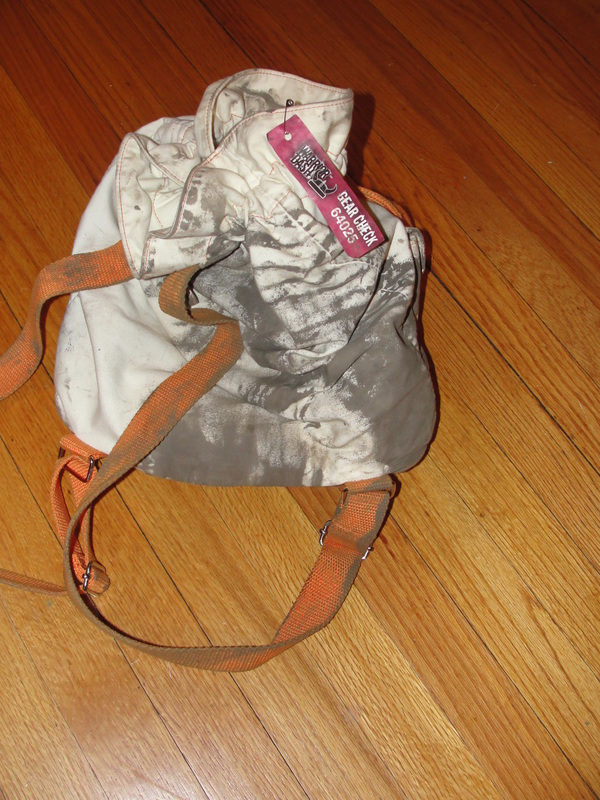 Which made for a *really* funny story when one of my teammates mistook the Vaseline for Gu. As far as the actual running, it went pretty well. 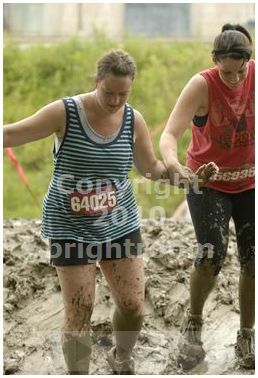 I haven’t really been training and the last two races I’ve entered have been disastrous (think: walking during a 5K). My leg was 5.6 miles and my *only* goal was to finish without walking… which I did. 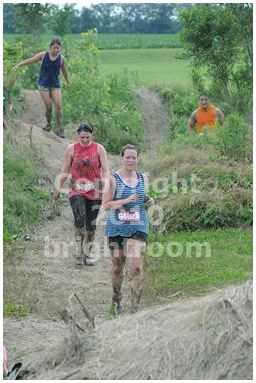 The course I ran was scenic and uneventful for the most part. I ran from Rock Island (which isn’t an island) to Arsenal Island (which is). It’s also—according to Wikipedia the largest government-owned weapons manufacturing arsenal in the United States. (which explains the COUNTLESS volunteers in uniform—HEL-lo!!). The last mile and a half or so were along a scenic river path. I had studied the map prior to the race but forgot to pay attention to the mile markers, so when I got towards the end I was having a hard time calculating how much further I had to go. I’ve never run on the second half of a marathon course before and I have to say—it’s different. The only people on the course were uber-fit marathoners and relay participants. So, for the most part I felt like I was running a training run. A training run with occasional snacks, a cold sponge and a gorgeous view of the river! There was very little crowd support, at least during my leg. It didn’t really bother me because I only had 5.6 miles to go, but I think if I was running the half (or the full) I’d probably appreciate a little more crowd support. 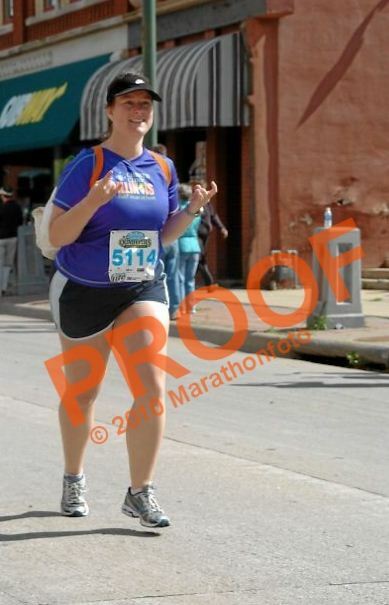 But maybe my expectations were too high from my experience running the Illinois Half-Marathon in my hometown. The volunteers were super nice as was almost everyone we met in the Quad Cities. Good folks, they are. 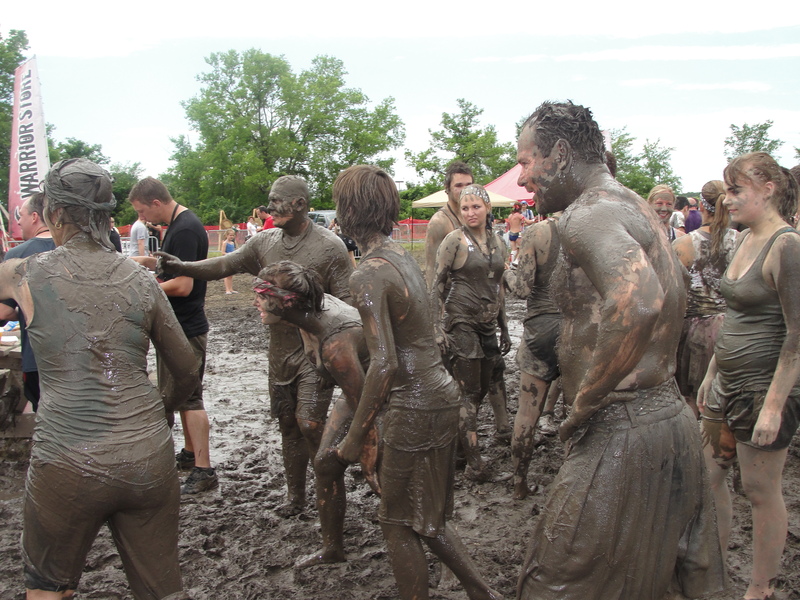 The race was definitely good for relay teams– there was a designated relay meet-up spot where we met our last teammate and we all ran in together. We each got medals and nice tech running shirts. No lame-o cotton t-shirts for this relay team. 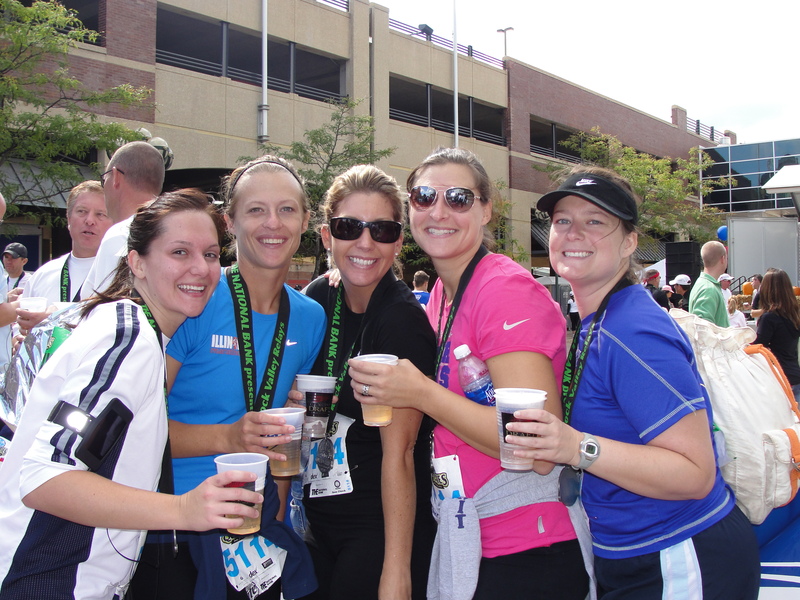 After the race, we had our complimentary beers (Miller Light) and headed home. Everyone was raving about the course and the weather. Well, everyone except Bobbi who ran the last leg. It was a brutal out-and-back with no river view. She wasn’t impressed, but I can’t imagine how it must have felt for the marathoners to have to do that in the last miles of 26.2. I’ve totally re-caught the running bug and wonder how much better I could’ve done had I actually *trained* properly for this race. However, it taught me a valuable lesson: It seems as though I’m more motivated by successes than failures. I thought the last two botched races would be the “wake up” call I needed to get me running again. Turns out, running *well* is what I needed to get going. Running well, great friends, beautiful scenery, and a perfect day! 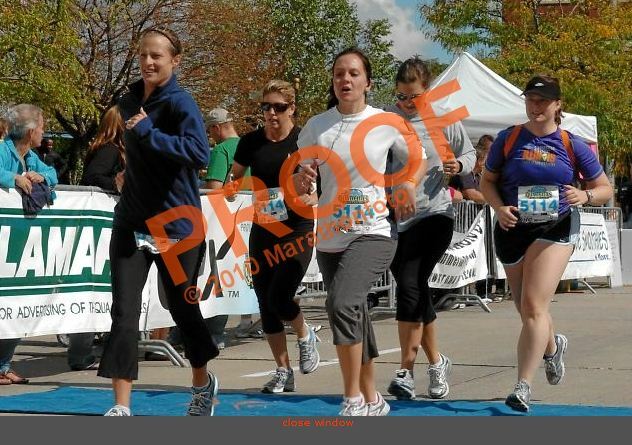 If you’re looking for a small(ish) fall race, I highly recommend trying it out. 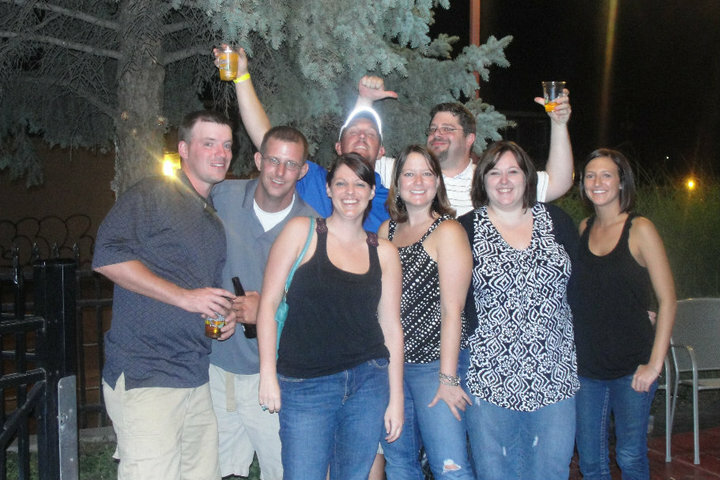 We are definitely going back next year and some of us are thinking of running the half. They also have a 5K and a 1 mi fun run for the kids. 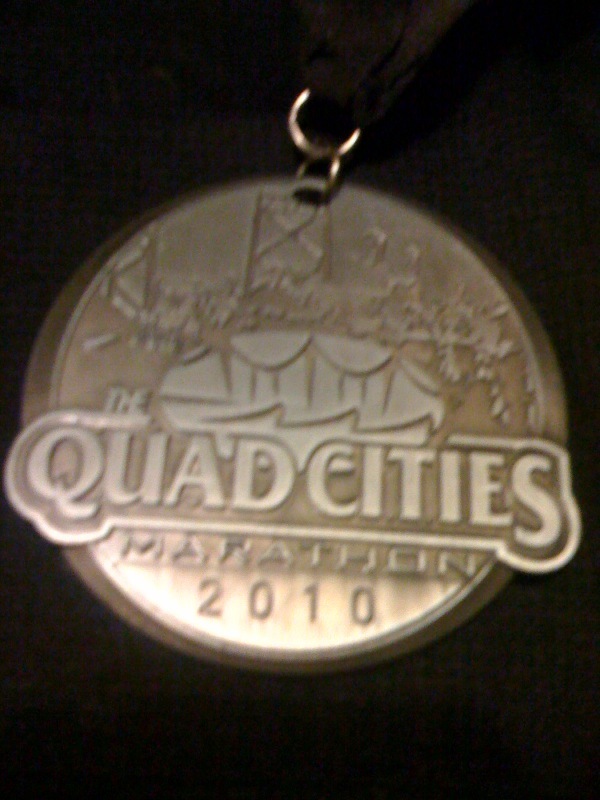 I really can’t say enough good things about this race and the Quad Cities in general. 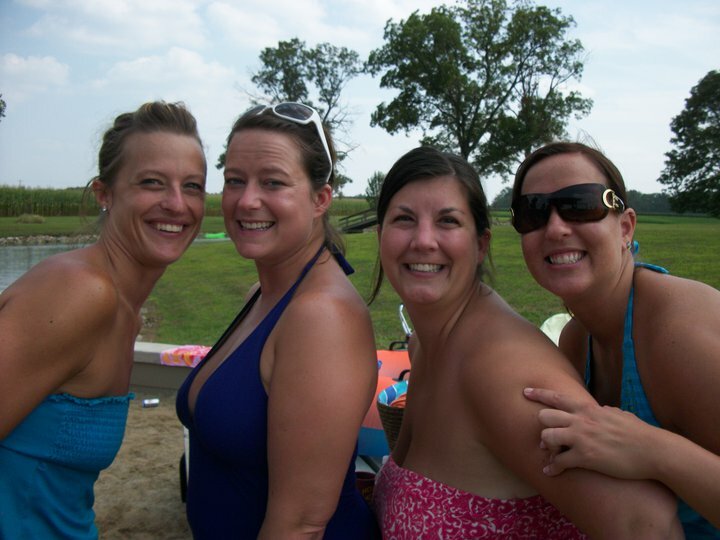 August 6– Pond day with Erin, Kim, Jamie: Perfect weather. Perfect day. Most amazing Frito/peanut butter/chocolate “dip” ever. Ah-mazing. August 7– Run 4 Raley. 3rd year in a row. 2nd year “running” it, even though I walked almost half and came in a min slower than last year. 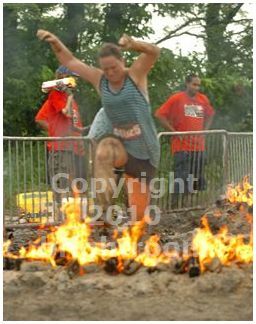 Yet another running FAIL. Yes, I'm orange-- I planned it that way! 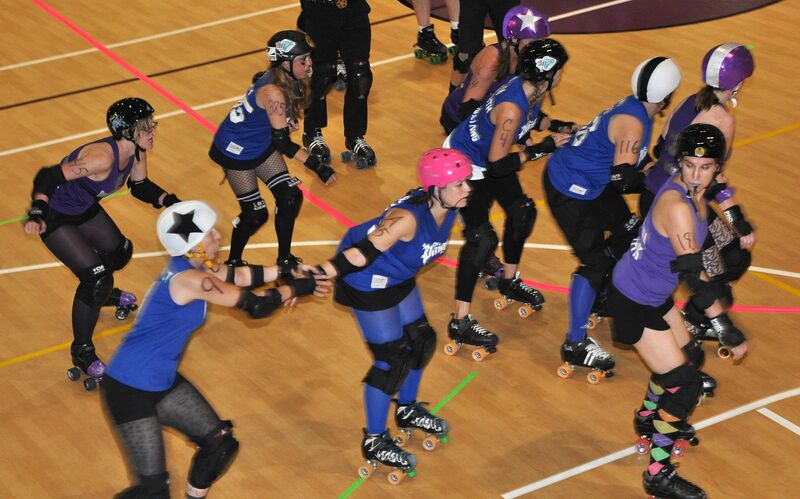 August 21– Twin City Travelers take on the St. Chux Derby Chix. I wasn’t chosen for the 14 person roster, but I made one helluva cheerleader! August 24-26: Trip with Kyle’s family to Tunica, MS for his birthday. I came out the “winner” by only losing $100. 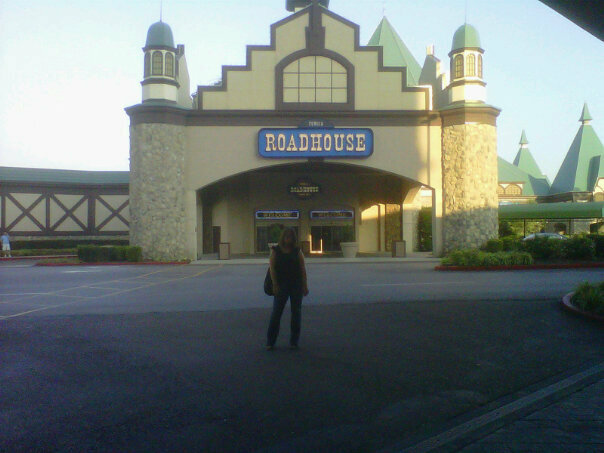 that's me outside our "roadhouse" hotel. Casino/lobby was very country-western, rooms were 80s "glamour"
August 27– Second TCDG bout. This time it was the ‘Paign (my team) vs. The Dames (newly formed ‘3rd team’). We lost, but it was a great experience. I ran the Kracker Klassic 5K this weekend in my hometown (there is no link–that’s how small this race is!). I was actually kind of excited to run this one because the race used to run by my house as a child and we always had a water station set up in our front yard. Since it was a hometown race, I knew the route would be boring, but I’d see a lot of people I knew there*. I think this is my 6th 5K, so I should be fairly used to them by now, right? Uh… No. I FAILed miserably. 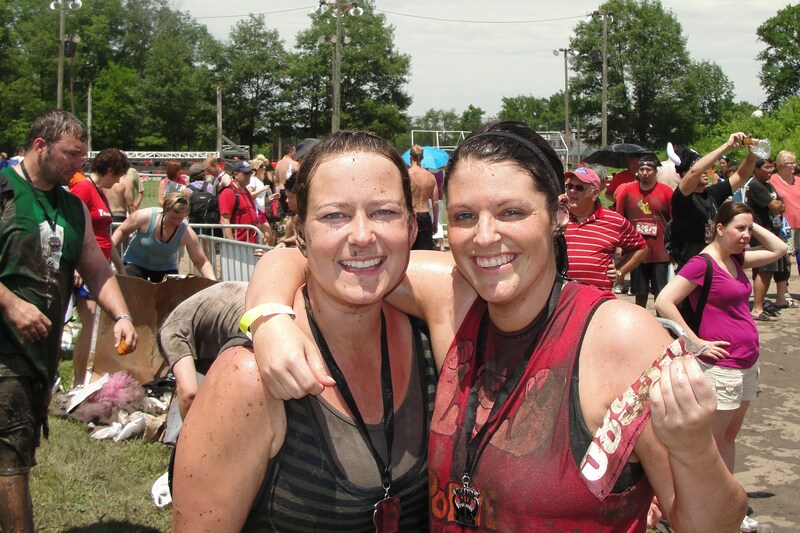 There are all kinds of excuses for why this happened: heat, humidity, strength training the day before,…. etc., etc. 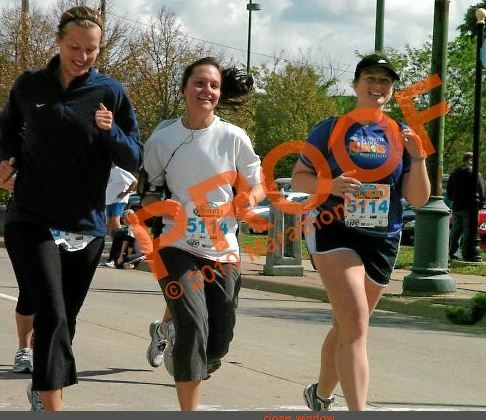 But the bottom line is this: I haven’t really been running consistently for months. I thought it would be no problem to do “just a 5K.” The morning of the race, I wasn’t really feeling it. And I hadn’t pre-registered so I seriously considered skipping it, but I was kinda hoping to validate my surprise PR from last month. I figured if I could finish under 32:00 I’d have an “official” PR to report. No dice. 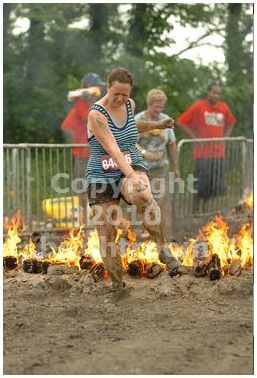 My time was 34:5x, barely under 35 and almost a full 3 mins slower than last time. This is my 3rd worst 5K time ever. I ran better hungover for crying out loud! I even took walk breaks. . . in a 5K! 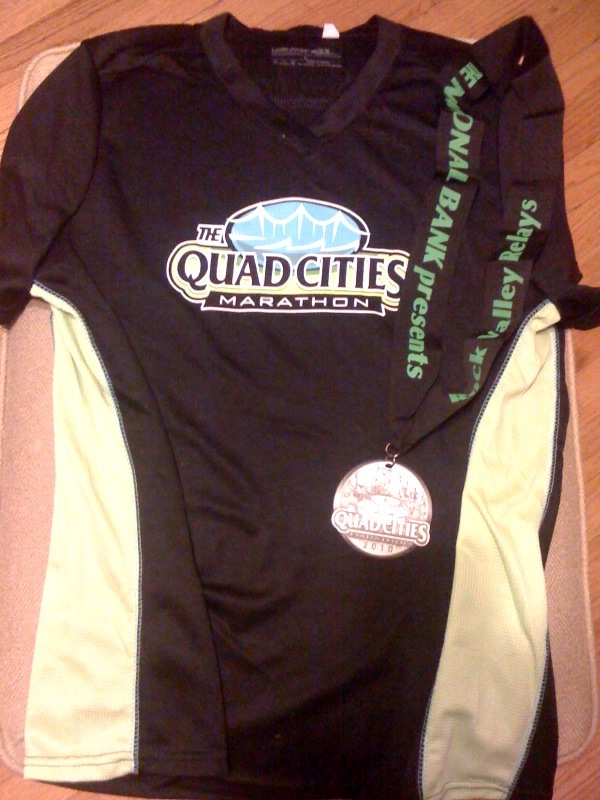 I ran a half marathon, damn it, I should be able to eek out 3 measly miles. But I didn’t. The running gods have served me a piece of humble pie and I’m eating it. I ran this morning with a renewed sense of purpose. I will NOT let heat/humidity keep me from training anymore. I *must* improve my times. Otherwise, all that hard work for the half seems all for nothing. I don’t even feel like a “real” runner right now. * I did see a lot of people I knew there, which ended up being more intimidating than I originally thought. However, because it was a small hometown race, I actually knew a lot of the winners, which was super cool. 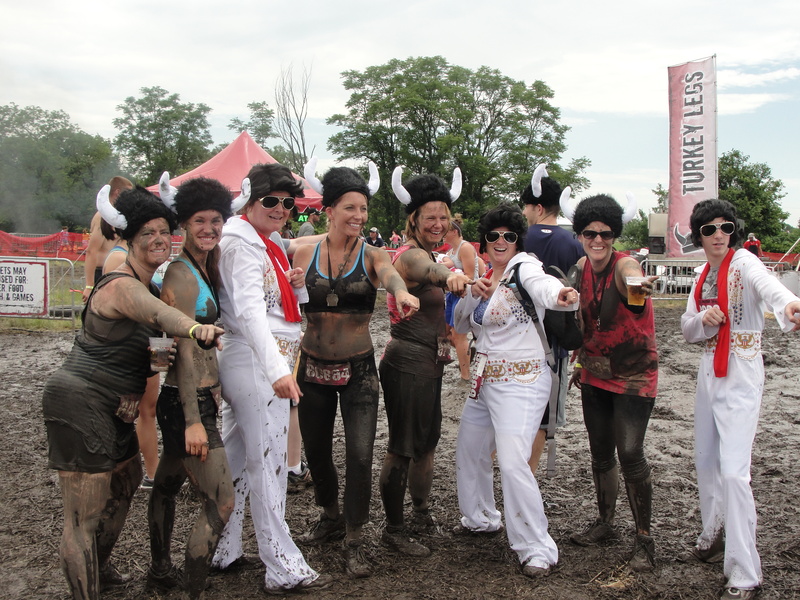 I actually had a completely different post planned for today, but then I got an email that the professional pictures from Warrior Dash were up. I was stoked that they were even able to read my bib # for some of these. 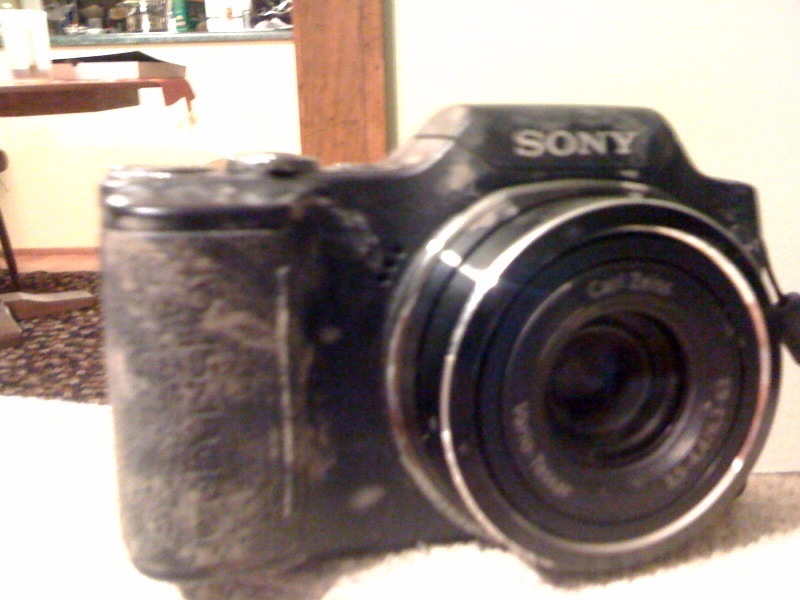 I haven’t *quite* finished looking through the “lost and found” pics to see if I can find myself diving into mud. Rest assured that if I do, part 3 will be on the way! Apparently my dismount is less-than-graceful! 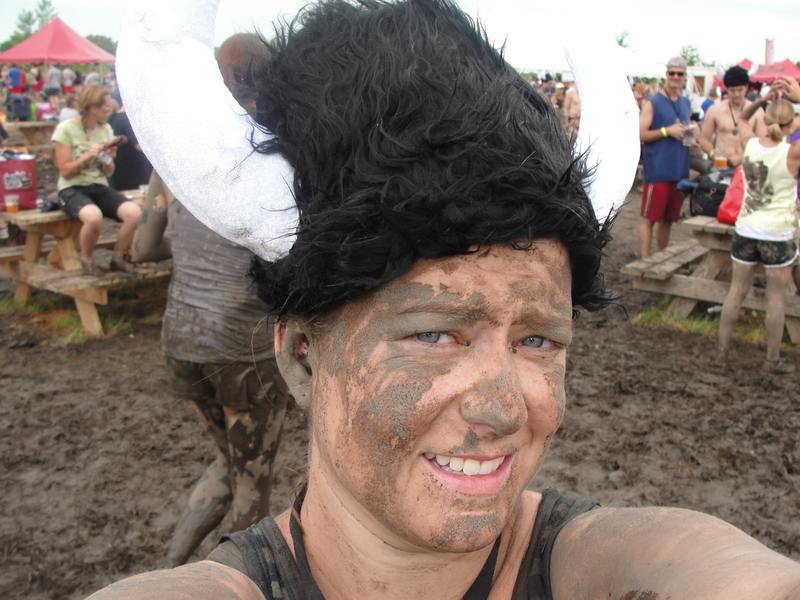 This past weekend, I participated in the Warrior Dash Midwest, a 5K (ish) trail run with 12 obstacles thrown in for good measure. I “ran” it with my friend NIkki, but–to be honest– we did a fair share of walking, so I consider it more of a fun run than a race. Potatoes, pot-ah-toes. 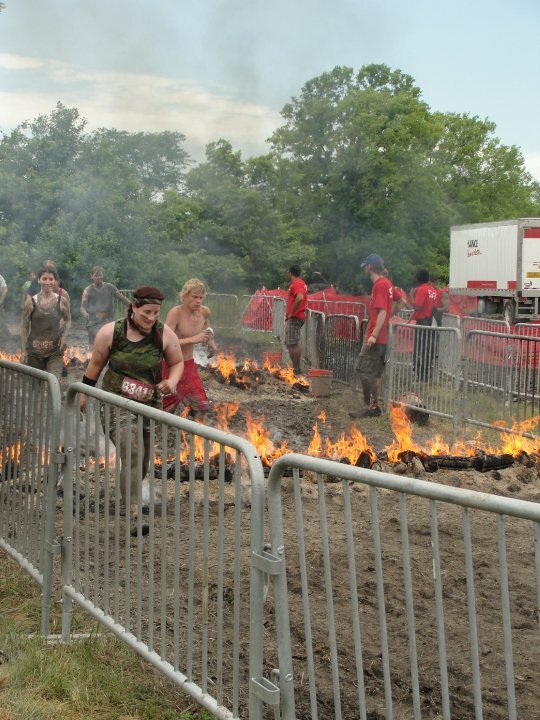 The Warrior Dash is unlike anything I’ve ever experienced… and I had no clue what to expect. 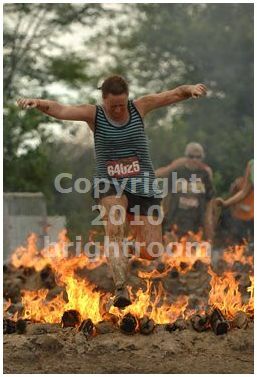 I hadn’t really trained for it and was a little nervous about the obstacles. Our heat started at 10:30 and it was already SUPER hot and sunny. But, my lord, it was SO MUCH FUN. 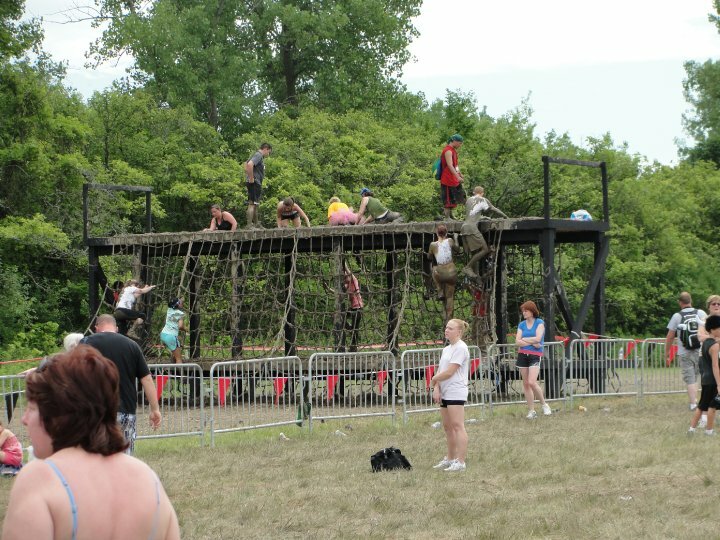 We jumped over cars, crawled through tunnels, scaled walls, climbed up cargo nets, jumped over fire, etc. 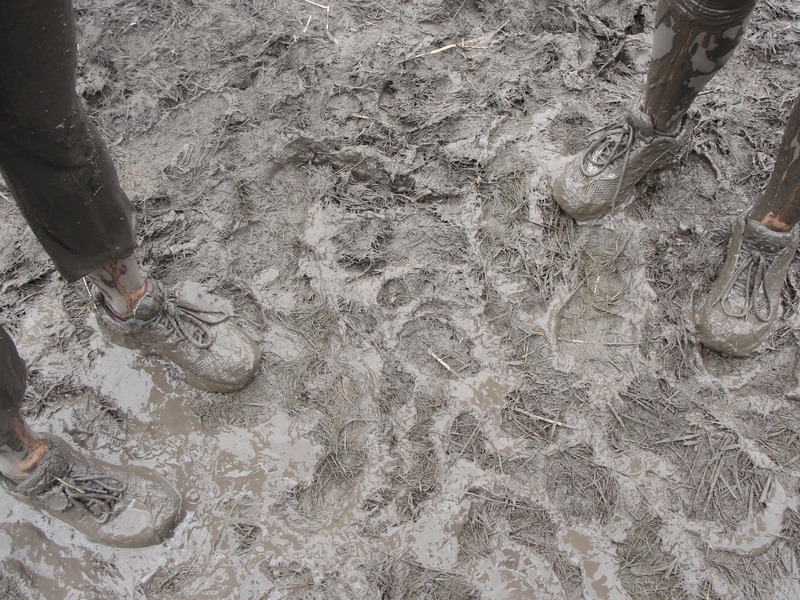 And then there was the mud! 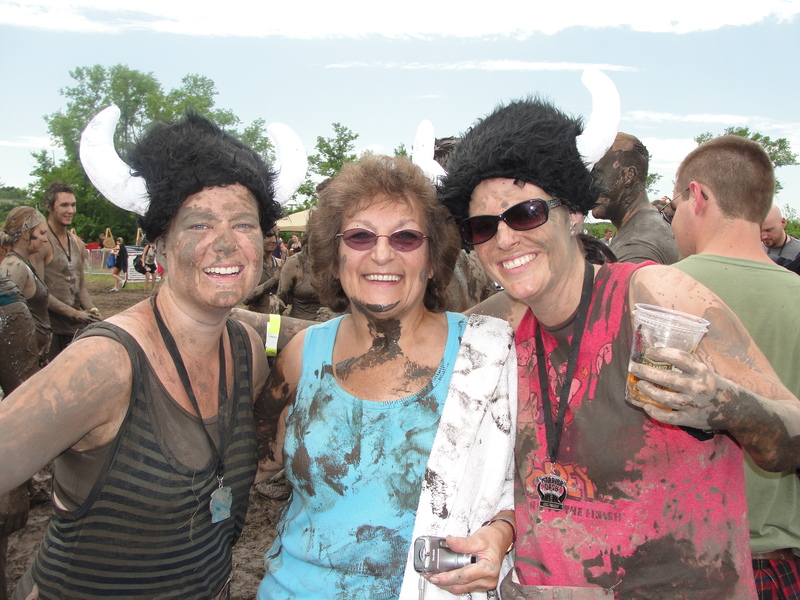 There were a total of 3 mud obstacles, but–as always– they saved the best for last. 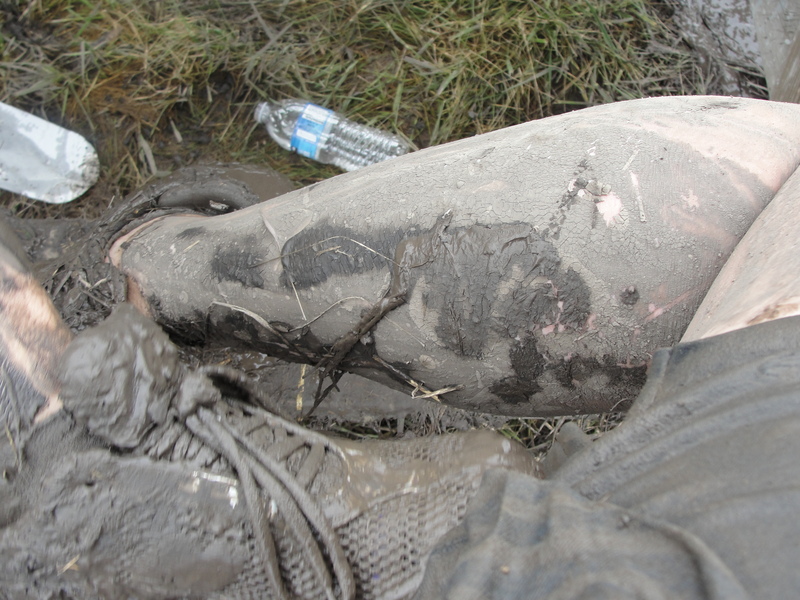 After the fire jump, you have to crawl under barbed wire in a HUGE mud pit. As soon as I came up to the pit, I hear the crowd chanting “Dive. Dive. Dive.” So I dove. 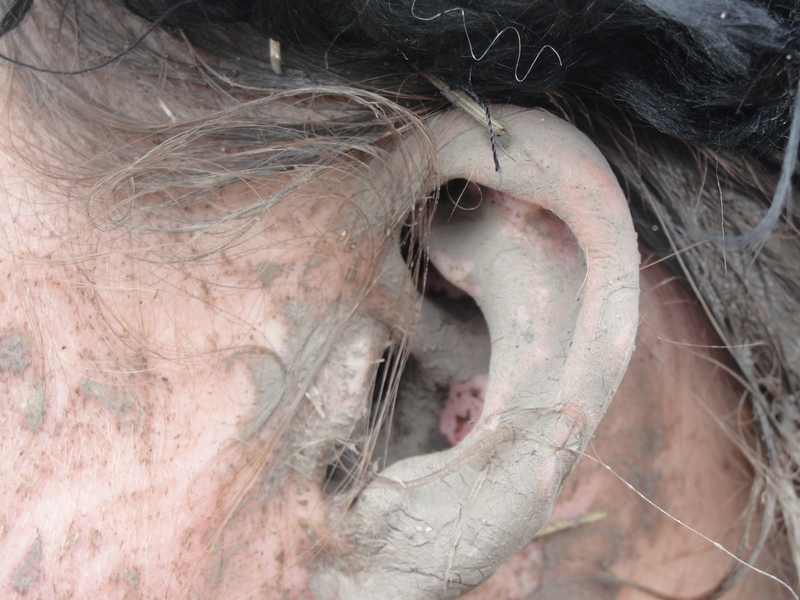 I got mud in my eyes… in my ears… in my nose… everywhere. It was sooo much fun. 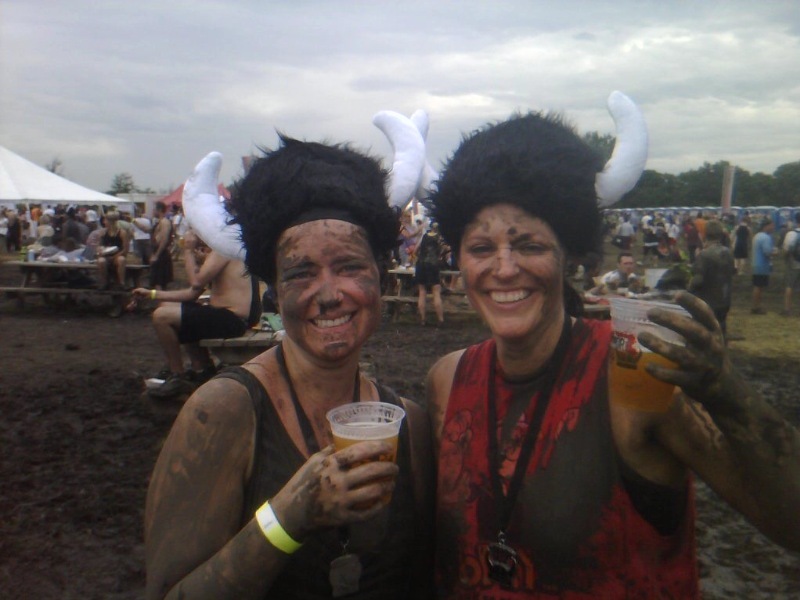 The after-party was the best part… lots of nice people gave us their free beer coupons and we had a great time conversing with other Warriors. 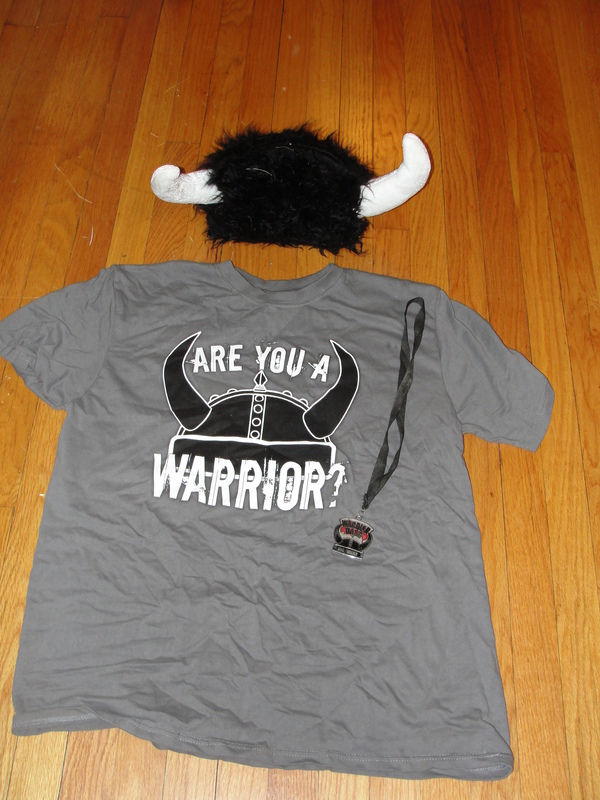 The bling was pretty nice, too: A standard cotton tshirt, a cool medal, and–wait for it– a warrior helmet!! Can’t get much better than that. 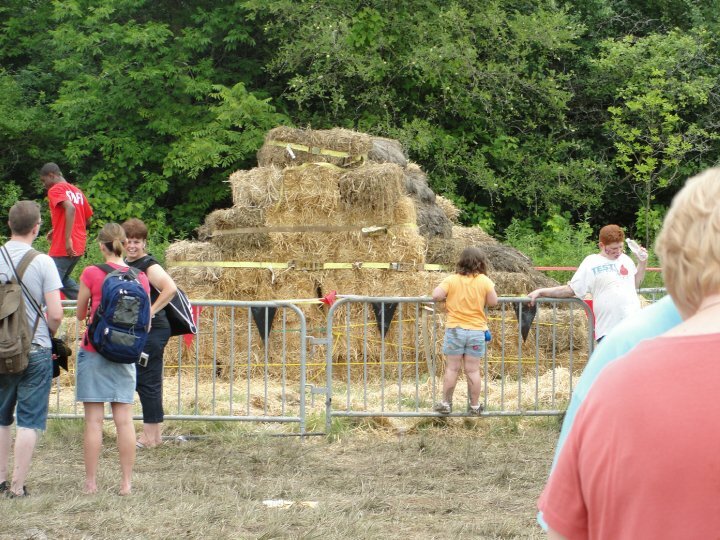 The hay bales were much easier than I expected. 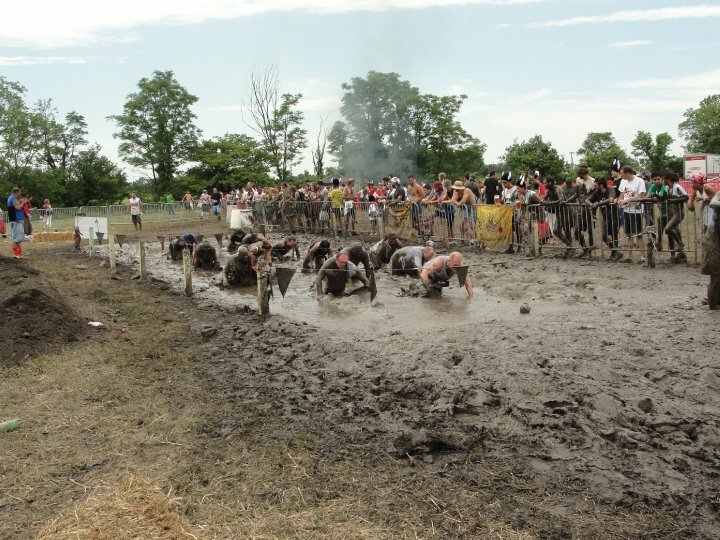 More like "hay steps"
The Army crawl throuh mud was definitely the most fun! 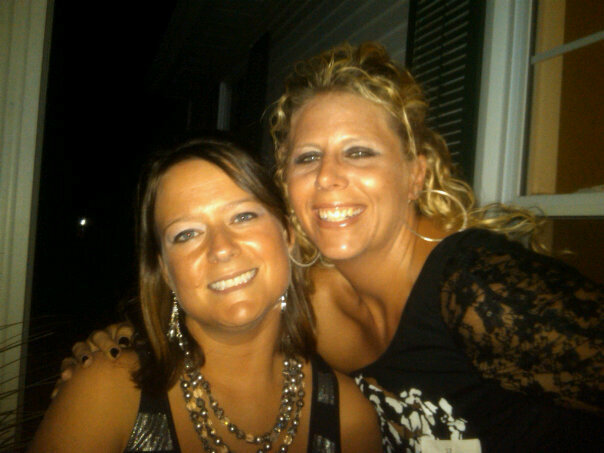 Correction: The afterparty was the best part! In the end, I finished in about 46 minutes. I’m not at all concerned about the time, though. It was SO.MUCH.FUN. 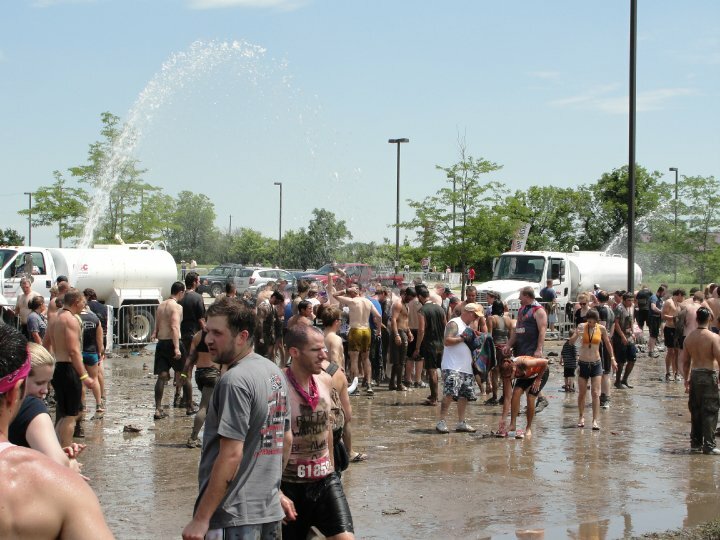 We’re already thinking of what we’re going to do next year!